I've had a few Triad watercolor sets on my desk from Daniel Smith. Finally I decided to play with the poinsettia one. I enlarge the image and painted it on watercolor paper. 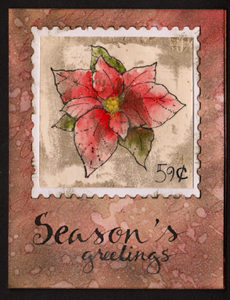 Then I decided to use a rubber stamp of a poinsettia and turn it in to a postage stamp. 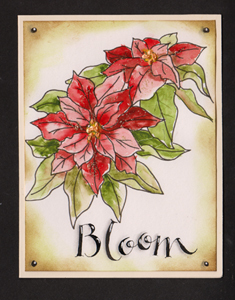 Sigh - the lettering bled on the background, but I guess it adds to the distressed look of the card with the crackling in the stamp. Your watercoloring is outstanding, Yogi! Really love the lettering and the way you added the shadow to the word. Such beautiful cards, both of them. The distressed look is fabulous! Beautiful! Thanks for joining us at Do You Stack Up. This is just absolutely gorgeous! What a vintage feel. If you hadn't said anything about the lettering bleeding, I would have thought you did it on purpose. It looks amazing! Thank you for playing along with us at Digi Doodle Shop's Best challenge this week! I am left speechless - these are so wonderful! Thank you for participating in Digi Doodle Shop's Best challenge this week! Beautiful work! Thanks for joining us for the Do You Stack Up Challenge Blog Brown Challenge! Please join us again for the next challenge! Gorgeous card! Thanks for playing along with us this week at DYSU. I like Daniel Smith watercolors too, but I really like your cards! They are gorgeous! !